Course Details — University of the Third Age (U3A Dandenong) Inc.
What is Genealogy? The Merriam Webster Dictionary defines Genealogy as “the history of a particular family showing how the different members of the family are related to each other”. This class is a pot pourri. It caters for beginners and for the more advanced devotees. We focus on documents, evidence, facts and testimony. The class can be taken by the half year or as an ongoing activity. The beginner’s class covers how to collect and collate information and accurate record keeping is stressed. Basic charting is covered. A course guide and some handouts will be supplied. Come and join this friendly group. When: Monday 9.30am – 11.30am, Where: At the Paddy O’Donoghue Centre, 18 Buckley Street, Noble Park, 3174..
Mahjong is an ancient Chinese game played with numbered tiles, winds and dragons. Players and newcomers are very welcome. We have the playing sets. Just come along to learn/play. Ipad/Iphone workshop is for Apple users. Whether you are new to Iphone or Ipod, it’s a basic workshop. To make full use of its potential e.g. How to send photographs be email messages, messenger or what’s apt. No exercise handouts, just bring a pen and notebook. Parchment Work is done on Plain Vellum, with various tools and many different Patterns. It’s a very pretty work – time consuming. We can make pretty greeting cards, Xmas Tree, shoes for Christening cake. Boxes of various shapes and sizes. Very decorative. Items can be painted or coloured with colouring pencils, oil paints or water colours. Positive Ageing is a term used to describe the process of maintaining a positive attitude, feeling good about yourself, keeping fit and healthy, and engaging fully in life as you age. 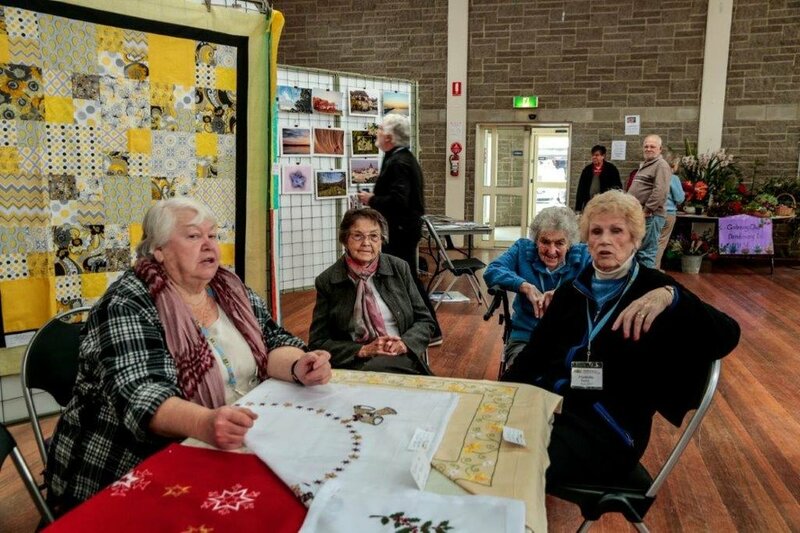 To achieve these goals, a course has been developed within the Dandenong U3A. • Staying Connected e.g. Meeting weekly;Theme song; Social Interaction; Sharing Items of Interest. • Intellectual Stimulation e.g. Problem Solving;Brain Teasers; Mind games. • Physical Activities e.g. Outdoor and Indoor Team games. e.g. Hooky; Finska; Quoits; Ball Handling Games. • Enjoying Humour e.g. Cartoons; Jokes; Skits; Recounting funny experiences. Guest Speakers will be invited to address the group on topics such as:- ‘Maintaining a Healthy Lifestyle’, ‘The Benefit of Exercise’, ‘Mindfulness’, and other relevant topics. This is a very active class of fifteen individuals. The subject discussed, some with very vocal responses deal with items of daily news, either from the media or television, like “Four Corners’ and Q and A. Over the past months the class had also had interesting speakers, either from the political world or from individuals like ‘Justice of the Peace’ or retired tradesmen who were eager to share their experiences. The venue for the weekly meetings is in the Dandenong Senior Rooms at 10 Langhorne Street. The class meets every Tuesday, unless there is a public holiday, at 9.30am. Following an hour’s discussion there is a morning tea break. Following the break discussions continue till the meeting ends at 11.30. This is a small class but one of high interest. The world of the ancients deals with the copper and bronze periods and covers the ancient world from the city of Ur in Mesopotamian up to the conquest of Britain, the creation of the Byzantium period and the age of the crusaders. Subject covered also includes individuals who have left their mark on the progress of history and at the minute the various ancient cities, especially of Mesopotamia have been studied. The study includes the various deities who have sparked interest in what they achieved in the creation of the society that they governed. All in all the class has followed with interest the steps of the ancients and what they achieved on the world stage. The class meets each Tuesday afternoon, unless it is a public holiday, at the North Dandenong Seniors Rooms at Latham Crescent, North Dandenong, at 2.30pm and concludes at 4.30pm. My painting class at Endeavour Hills is a group of friends who encourage each other, inspire them to achieve high standards and who surprise themselves with their talents. I get great pleasure from helping each person find the gift of being creative, producing paintings of which they can be proud, and having their families truly treasuring the paintings produce in class. The U3A has been wonderful for me during years of family stress, it helped keep me sane(?) and I really appreciate the friends I have made there. The Classes run for 45 minutes. The class always starts with a warm up to music for approx 10 minutes and finishes with abdominal work and stretches. The remainder of the class runs in a variety of formats. • Group exercise. The class is usually divided into 2 or 3 groups for strength work, each group has either arm weights, leg weights or a resistance band, each person rotates through each group. • 45 second intervals. A variety of strength exercises for 45 seconds followed by 45 seconds of cardio work. • Double Ups. The same muscle group is targeted with 2 different exercises, preferably performing the easier exercise first. Repetitions vary. • Slow / Fast / Slow. The same exercise is performed at different speeds, to use both fast twitch and slow twitch muscle fibres. • Pyramids. A group of 3-4 exercises is performed, initially 2 repetitions each, then 4 repetitions each and so on up to 8 or 10 reps and then back down again. Great for strength and endurance, but hard. • Change Stance. The same exercise is performed with first feet together, then one foot in front of the other and lastly the other foot in front. Good for balance and endurance, usually 8-10 repetitions in each foot position. • 21s. An exercise is performed in a different range of the muscle -7 outer range, 7 inner range, 7 full range. It is never dull!
. Persuasive and Argumentative speeches.
. Presentations of personally composed Ballads.
. Explanatory presentation using props.
. Procedural presentations using props.
. Small-group humourous skits based on given themes.
. Personal Narrative and Verse readings.
. Recounting of personal events.
. Whole-group debating on a given issue. 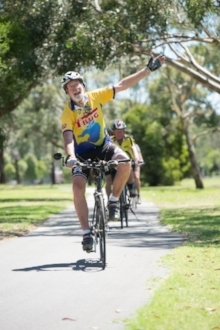 The group meets at pre-determined locations around Dandenong to give us the opportunity to cycle along the many paths following the Dandenong Creek and other paths that link up to it. We usually commence at 8.30am and take a coffee break around 10am before returning to our start point via a different route. All up we cycle about 30 kms each ride . It's surprising the amount of options available to us. During school holidays we have “special rides”. These rides take us on trails further away. Eg: The Warburton Rail Trail or the Bayside Trail. We cycle all year round, the only exception being rainy days. That alone is testament to the camaraderie amongst the group. This ride is now self managed. The leadership is open to any of the group and they can choose what track to take on that day they lead. Our tracks cover a lot of ground and the distances can vary from 30 kms to over 50. We do have a coffee stop halfway along the track. However, our rides do depend on the weather. We don’t ride if the temperature is going to reach over 30 degrees and also if it is raining. This group is small in numbers and we would welcome other riders who would be interested in joining us, you would be most welcome. Contact Number: 0459220600 This class is for absolute beginners. At the beginning of each semester we begin from scratch. We practice the dance steps such as 'vine' and 'kick ball change' until we've got it. The dance steps are danced in sequence which is called a 'routine'. The routine is repeated only facing a different wall. This is when the brain is tested and we all laugh together as we get it mixed up. Only one dance is taught each month. The tutor is very patient and will encourage you not to give up. Give it at least one semester. A toddler falls many times and takes more than one day to walk confidently on his or her own. Previously learnt dances are walked through before we dance to the music and is many are still struggling with some part we stop and practice that section. The current dances are Boot Scootin Boogie; What a Feelin; Cowboy S; Peaches and Cream; Limes; Woman is Smarter; Smokey Places; Ghost Train. We all meet every Monday morning from 9.30am to 12.30pm. We do a variety of dishes. The members cook a main meal and a sweet ,which they taste. Each member of the group takes their cooked dish home. I bring the recipes and everyone gets a copy to take home. This is a friendly self -help group which requires no previous expertise in drawing. Beginners are welcome and can receive guidance and handy hints from other class members, so don't be nervous! Members of this group use a variety of media - pencils, coloured pencils of various kinds, ink, pastels etc., or even relax with a colouring book. Bring along some pencils and a drawing pad and you're welcome to join us. This is a 6-week course using either your own laptops or the U3A laptops which are running Windows 10. Each lesson will start with Windows 10 instruction and then go on to Microsoft Excel topics. We will start with the basics and continue to cover as many topics as we can fit into the time, but should include entering data, auto-filling cells, formatting cells, conditional formatting, sorting data, creating a chart, inserting sparklines and using a table in MS Excel. Mondays 1pm to 3pm starting 6th February 2017. This is a 6-week course using either your own laptops or the U3A laptops which are running Windows 10. Each lesson will start with Windows 10 instruction and then go on to Microsoft Word, the Internet, Email, and some basic Microsoft Excel topics. Mondays 1pm to 3pm starting 27th March 2017. This pattern of alternating Excel and Intermediate courses will repeat for as long as there is a demand for them. We are a friendly and enthusiastic group consisting of beginners and post-beginners. Classes are held Tuesdays and focus on building knowledge on grammar, vocabulary, writing and enhancing listening and speaking skills. Students are encouraged to speak Spanish through role play, reading Spanish stories and translating English into Spanish and vice versa. We discuss cultural events, personal experiences and often dance around to Spanish music. We enjoy learning about traditions, culture, costumes and music of Spanish speaking countries. This class is for those who already can and those who want to learn. Margaret and Lorraine are patient tutors. Bring your own project and be inspired by others who share their knowledge. If you want to learn to knit, bring one ball of light coloured plain 8 ply (sportsweight) yarn and 4mm needles. If you want to learn to crochet, bring two different light coloured plain balls of yarn in 8 ply (sportsweight), one 4mm hook (the type with a flattened grip area) and a folder in which to put the supplied notes. No need to book in beforehand. Just turn up and expect to join a friendly chatty group. Teaching is one on one but you may not be the only person needing help so bring something else to go on with whilst waiting.